Just as what I expected...clear glass, very pretty, dainty and elegant and versatile, we will be using it for our give-aways, with mini cupcakes and French Macarons in it! I bought these out of a whim, because they looked so darn cute. Used them at so many parties for displaying cupcakes, paper flowers and mini christmas balls. But, there's no personalisation available for these, so I'm not big on giving them away as favours. I have been researching online the wonderful small worlds people have created within these little jars. I can't wait to draw names for Christmas. I used them for my miniature wedding cake as favors. Size perfect, color (white) perfect. WOW What a Pleasant SURPRISE !!! This product is very will made. Q:Does this come in a small individual box.? Q:Will the jar fits two standard macarons? A:A set of 4 include 4 lids and 4 bottoms. Q:how to get the custom labels? A:For this item, we do not sell the labels from the example. Q:Hi - will this hold a standard sized cupcake, or just the minis? A:This item is 4"H, 3" diameter, and should hold a regular sized cupcake. Q:Can this product be personalized? A:We are not able to personalize this product, but do offer personalized labels to place on the jar for a customized look! Q:What's the white base made out of? A:The base is made of a metal alloy painted white. Looking for a creative way to display desserts at your wedding reception? 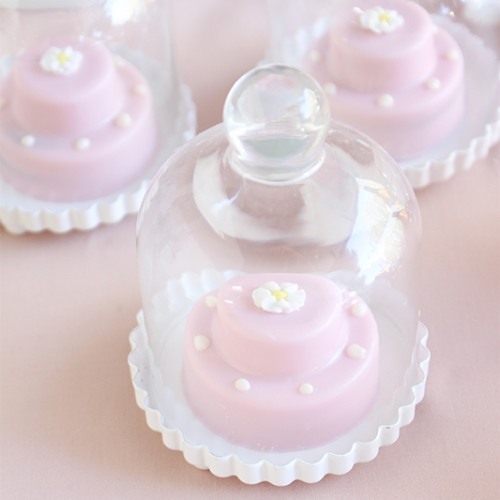 Add these miniature glass bell jars to your dessert table! They make the perfect cover for miniature cupcakes and candies. Or, get creative with these bell jars by filling them with wedding decorations to match your theme and using them as centerpieces. Use these beautiful jars to display personalized mini cupcakes or homemade baked goodies in stunning patterned cupcake wrappers.